It’s good to have friends to fall back on no matter what, even when it comes to celebrities in the ever-competitive Hong Kong entertainment industry. From traveling the world together to competing in friendly competitions, here are five Hong Kong celebrity cliques that’s making rounds in the entertainment scene today. Perhaps the most well-known clique in the Hong Kong entertainment industry is The Nonsense Club, which makes up of the Wu sisters Myolie Wu (胡杏兒), Nancy Wu (胡定欣), Paisley Wu (胡蓓蔚), as well as Selena Lee (李施嬅), Mandy Wong (黃智雯), and Elaine Yiu (姚子羚). The girls of the Nonsense Club are all well-known TVB stars and fadans. Though Myolie is no longer with TVB, the girls still meet up on a regular basis, and recently filmed a travelogue for TVB. 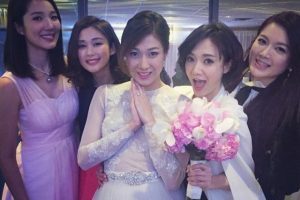 Consisting of Linda Chung (鍾嘉欣), Leanne Li (李亞男), Christine Kuo (苟芸慧), Grace Wong (王君馨), and Eliza Sam (岑麗香), “The Virgin Gang” is a name dubbed by the media. The name was coined after Grace revealed in an infamous 2012 interview that she wanted to remain a virgin until marriage. The five girls actually share many things in common: all are devout Christians, all from North America, and all have made their debuts in the industry as beauty pageant contestants. Four of the girls are now married, with the exception of Christine—though that may change soon! The newest addition to the HK clique arena is “The Housewife Alliance”, which comprises of Katy Kung (龔嘉欣), Grace Chan (陳凱琳), Zoie Tam (譚凱琪), and Jess Sum (沈卓盈). These girls became close friends after collaborating in the TVB drama The Forgotten Valley <平安谷之詭谷傳說>, which has yet to air. According to the media, Grace, Katy, Zoie, and Jess bonded over their mutual interest of doing “housewife activities.” Though it’s only been one year since the Housewife Alliance came together, TVB is eyeing them to be the successor of the Nonsense Club and will be producing a travel show for the girls. Not all cliques need to have names to stay strong. Winki Lai (賴慰玲), Anjaylia Chan (陳嘉寶), Super Girls’ Cheronna Ng (吳嘉熙), Venus Wong (王敏奕), Kandy Wong (糖妹), Jeannie Chan (陳瀅), and Stephanie Ho (何雁詩) all became close friends after working together in the TVB dramas Never Dance Alone <女人俱樂部> and Raising the Bar <四個女仔三個BAR >. The girls are all known for their youthful looks and their popularity in social media. The co-ed Crazy Runner is a team formed by TVB artists who share the same passion for running. It consists of the girls of the Nonsense Club, including Benjamin Yuen (袁偉豪), Joel Chan (陳山聰), Jack Wu (胡諾言), and Brian Tse (謝東閔). Crazy Runner has a TVB program Shall We Run <一起跑過的日子>, which documents the members’ jogging journey. The Nonsense Club might be a more well-known group, but it’s definitely one that annoys me the most. Especially recently. It’s like any time a member of the group has an interview, their group just has to be mentioned. Urgh. @dandan Agreed, And I find Housewife Club annoying too (maybe because I follow a few of them on instagram). The four of them make their friendship seem like it is all for attention e.g. doing a photoshoot for their “1 year anniversary”, requesting fan art of their housewife club, posting identical captions etc. Doesn’t the “Virgin Gang” call themselves Amazing Esthers or something? I feel like they have a name but i can’t remember what it is. @hellome Yeah you’re absolutely right! They do call themselves Amazing Esthers. @hannah lol!, funny isn’t it? @hannah now they’re the ex-virgin gang but who were they trying to fool in the first place? Especially Linda chung lol! There should also be a group called the Plastic Party. We all know who would be the leader of that one, lol. This one is for men and women.Then there should be one called the Beard Partner. This one can have both men and women too. @bubbletea Who would be in the plastic party? Raymond Lam, just to name a few……….. Funny thing is, that would be the biggest clique of all the cliques in the HK entertainment insdustry, LOL. That and the Beard Partner. The other Asian Beard Partner that is a much bigger clique than the HK one is the Taiwanese one. Lol. @huynh Agreed! Before Myolie’s group or Linda’s group, there was the “Seven Sisters”. These new ones (aka #3 to 5) are like…what the heck umm no one knows they’re a thing. There’s also one friendship group with Dodo Cheng (至八會): 汪明荃、郑裕玲、冯美基、张艾嘉、狄波拉、毛舜筠、林建明、顾纪筠、陈淑兰、曾华倩、朱慧珊以及江欣燕、外钟慧冰、施丽珍、寇鸿萍, etc. This news article is incomplete!!! Totally missing 1 important group! It’s called the “七姊妹” (7 sisters group). They’ve been around for over 10 years! How can anyone not know this!?? @shimmerstars 1st group i thought about b4 reading this article too.